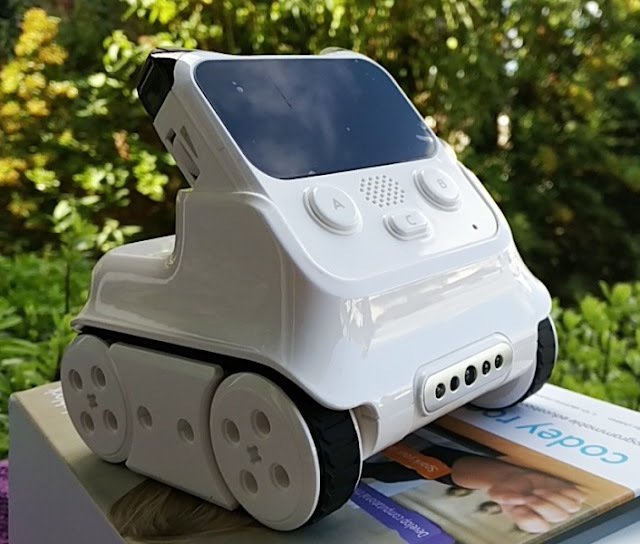 Indeed a character of few words, PacMan's famous "waka waka waka" sound effect bring instant nostalgia to those of us old enough to remember! Arcade games like Pac-Man used to be where my weekly allowance mostly went towards in the early 1980s, one penny at a time. 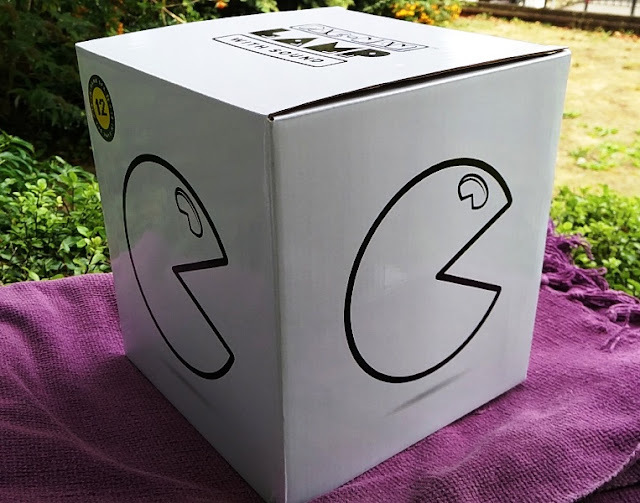 Even after more than 30 years, the Pac-Man figure remains as iconic as its older brother, the smiley face which was conceived in the early 1960's. 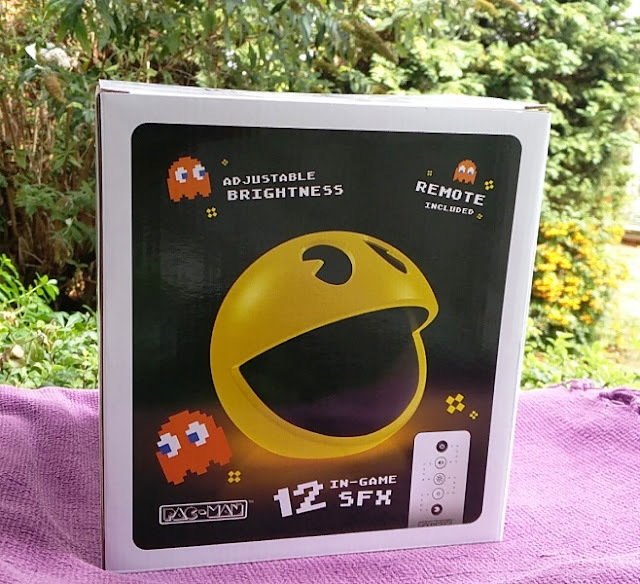 The retro Pac-Man lamp is a fun novelty light because of the in-game sound effects which you get 12 original sounds to choose from including Pac-Man eating ghost sound, ghost turns blue sound, ghost spurt move sound, credit sound, Pac-Man eating cookie and Pac-Man gameplay sound. 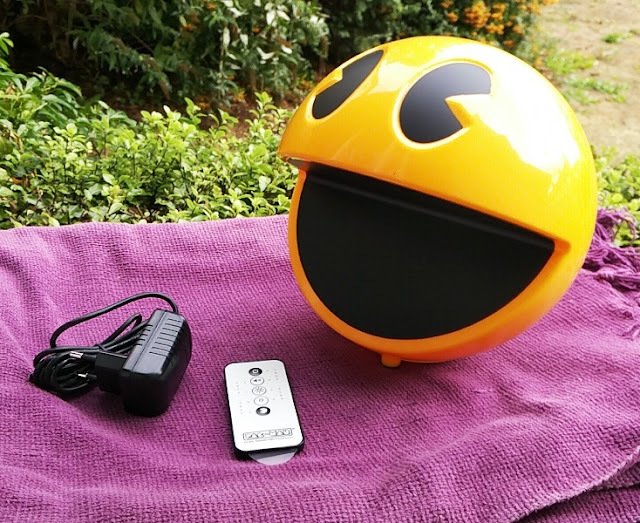 The built-in speaker in the Pac-Man lamp is set to very loud right out of the box but you can adjust the volume via the remote control. 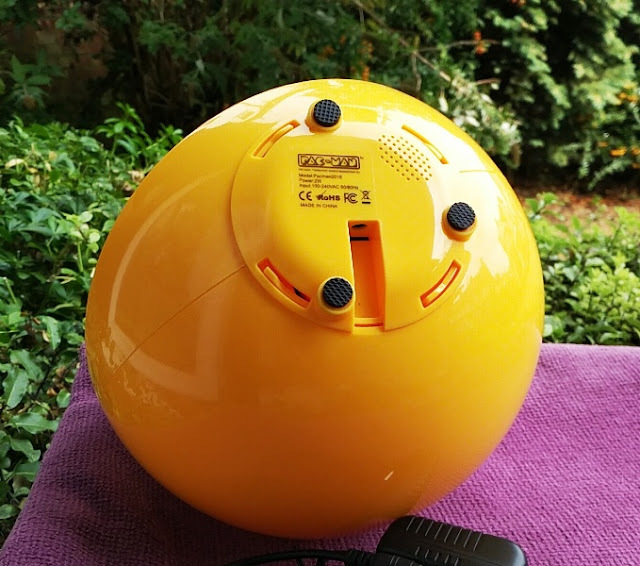 The speaker delivers clear sound even though it is located on the bottom of the Pac-Man lamp. 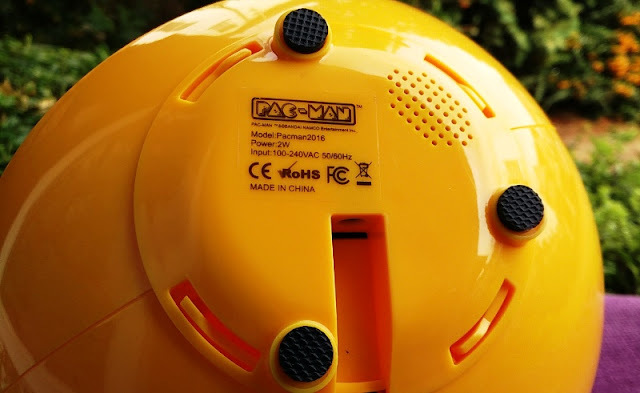 On the bottom of the Pac-Man lamp, you find the DC barrel socket and three rubber feet which stabilizes the Pac-Man lamp and prevent it from sliding around. 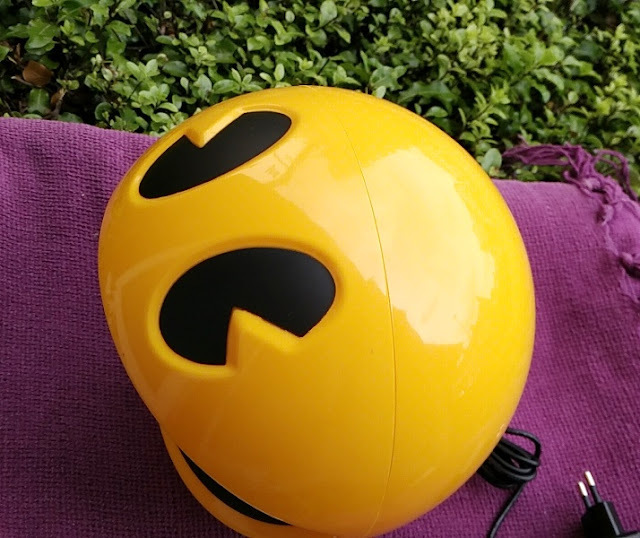 The Pac-Man lamp only weighs 340 grams but has a nice size to it, measuring 20 by 20 (20cm long, 20cm wide and 20cm high). 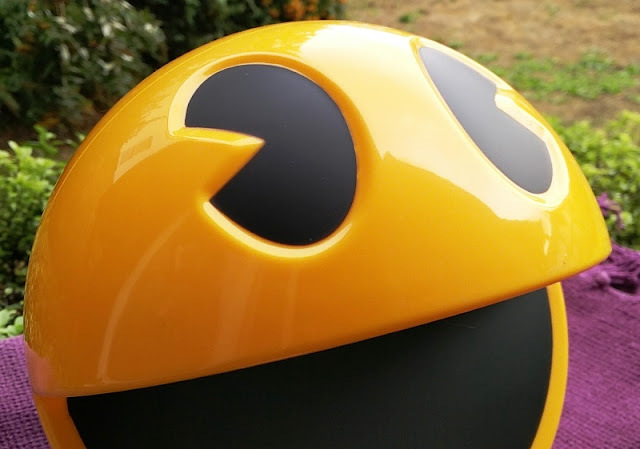 The electricity running costs of the Pac-Man lamp are negligible as it only uses a 2W bulb. 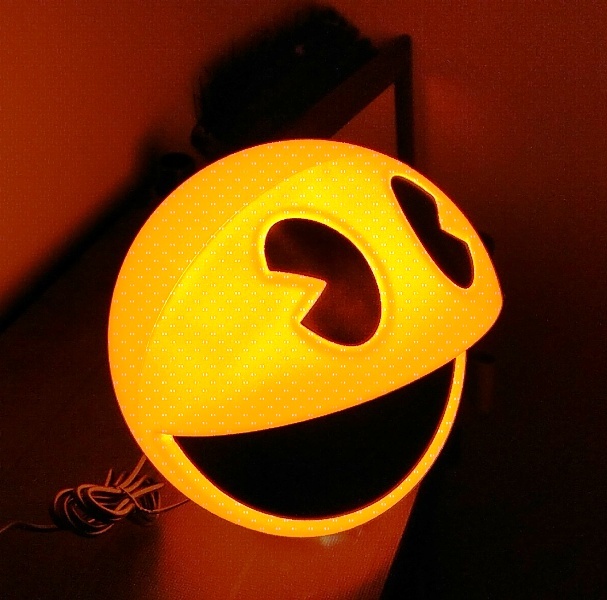 To give you an idea, the average light bulb in a home uses 60W so at 2W the Pac-Man lamp is very energy efficient. 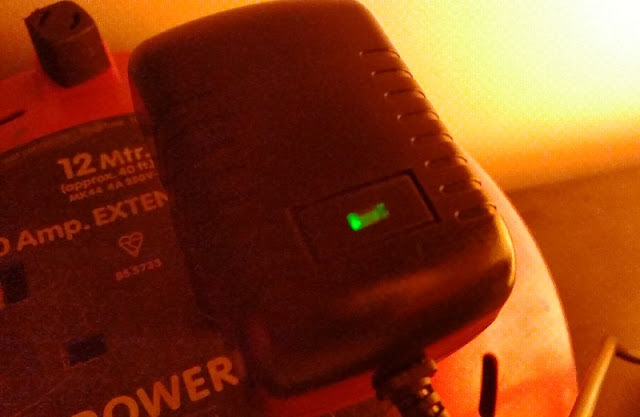 While only 2 watts, the Pac-Man lamp still functions as a useful bedside night lamp as it gives off a warm glow bright enough to find your way around a room (not bright enough though for bed time reading). 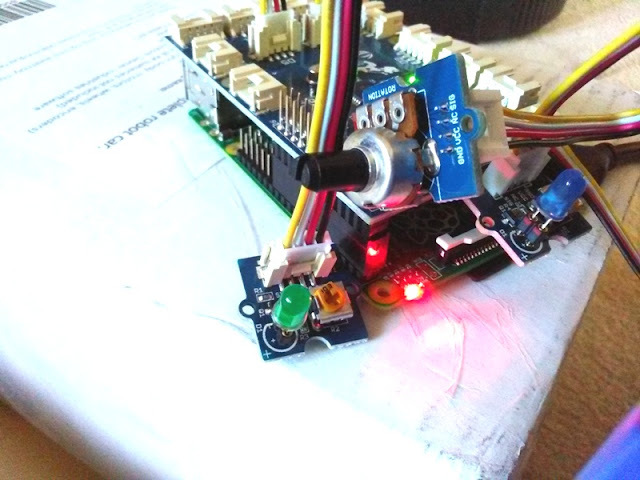 You can dim down the light to a low glow or a bright light via the included remote. 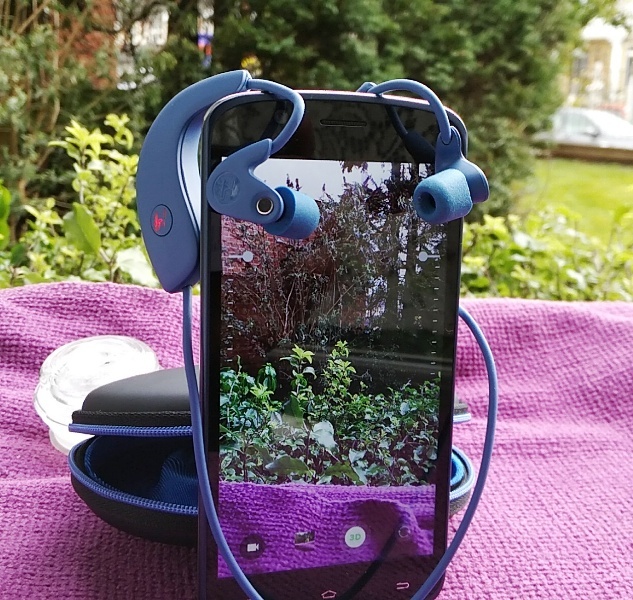 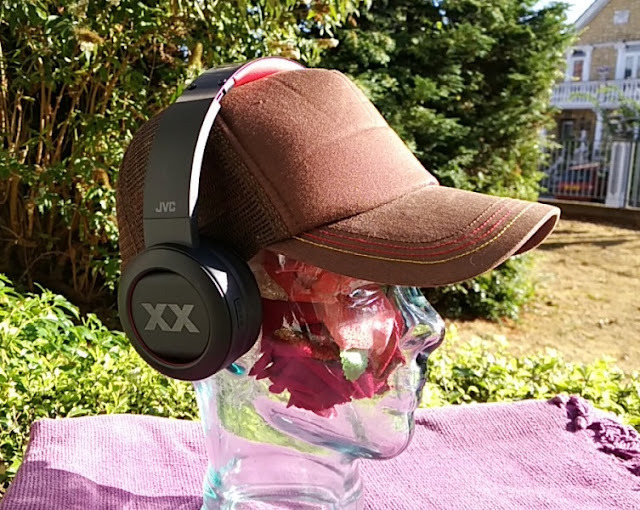 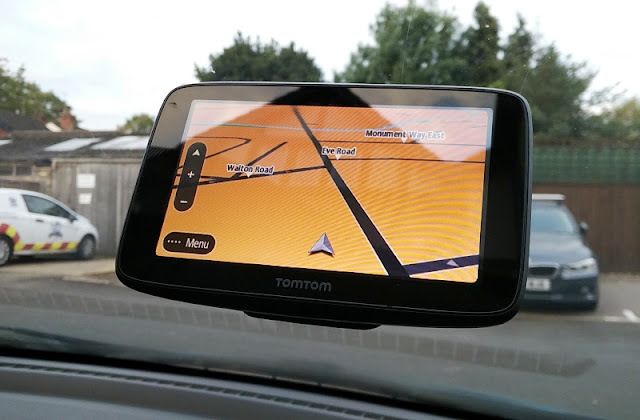 There are a total of four brightness levels you can choose from. 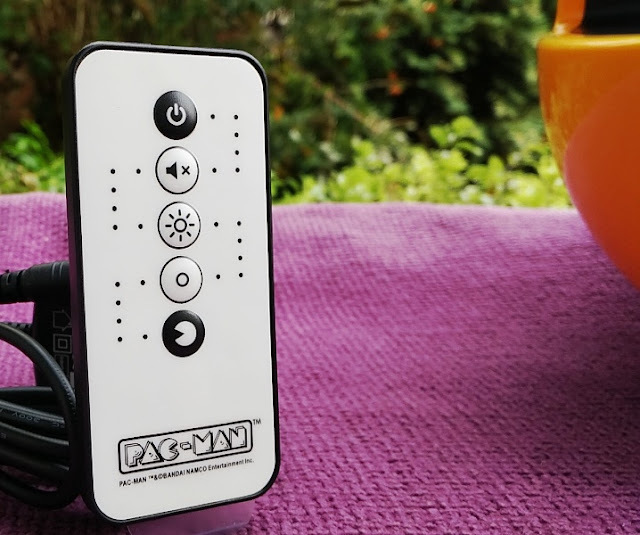 Talking about the Pac-Man lamp remote control, it is design with a Pac-Man maze theme in black and white finish. 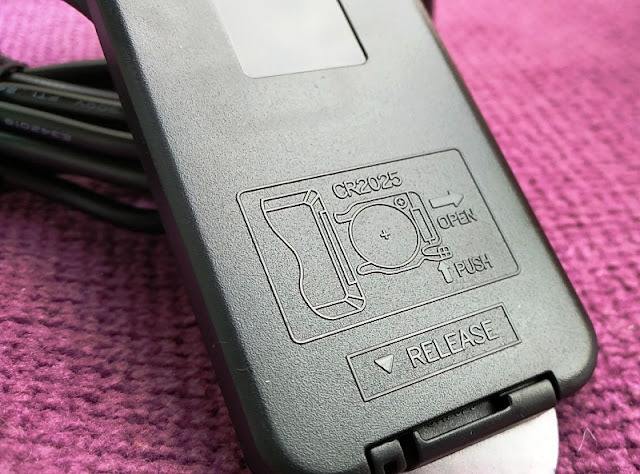 The remote uses a 2025 coin cell battery which is included. The 2025 coin cell battery is thinner than the 2032 coin cell battery. 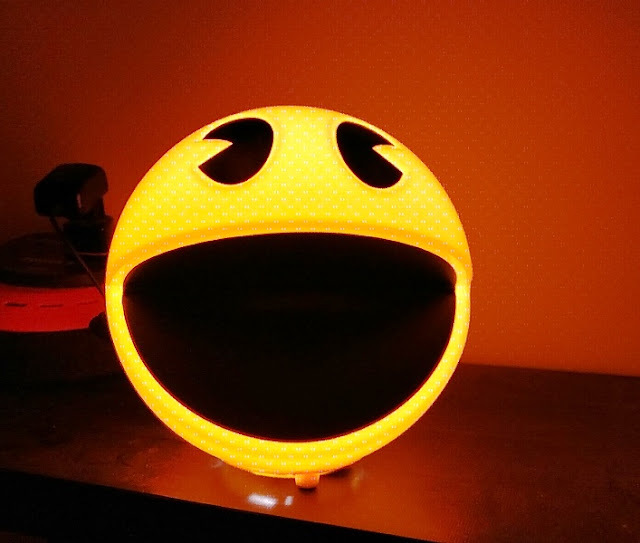 As a retro gamer, the Pac-Man lamp makes a cool gift and an awesome collectible item too especially if you're a big fan of "chiptune" retro sound chip 8-bit music. 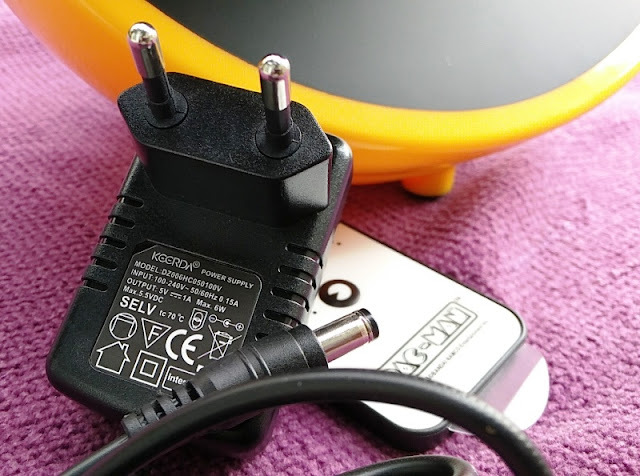 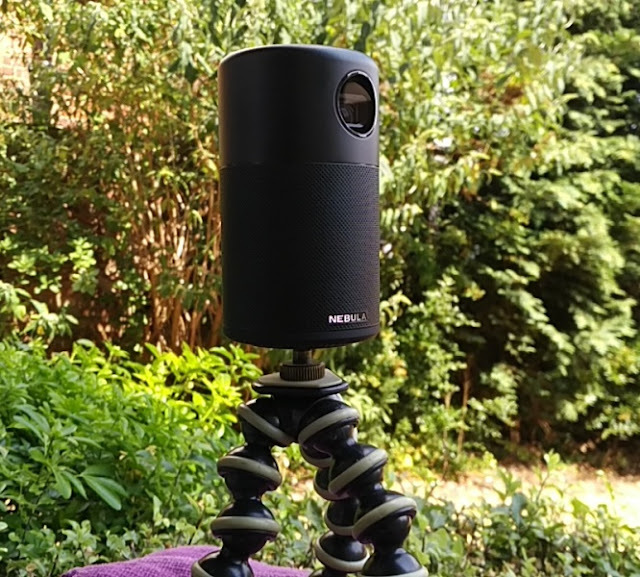 The Pacman sound chip lamp is not USB rechargeable but mains powered so the lamp is powered via a 5V 1A wall socket power adapter with DC barrel jack which is also included. 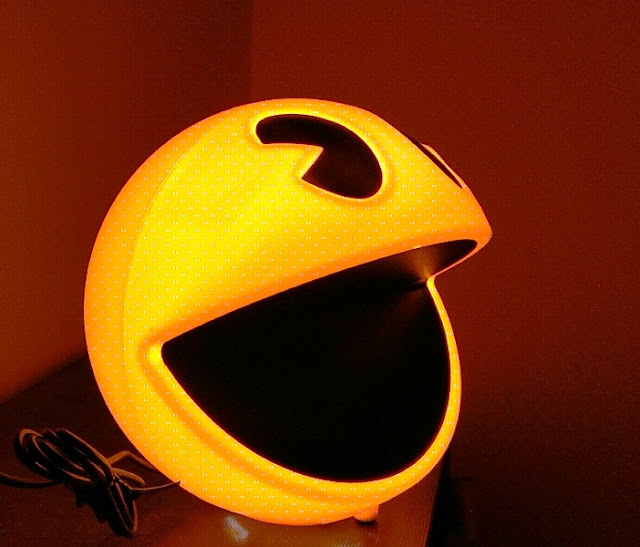 The Pac-Man lamp is child safe thanks to being made of plastic and running with low power. 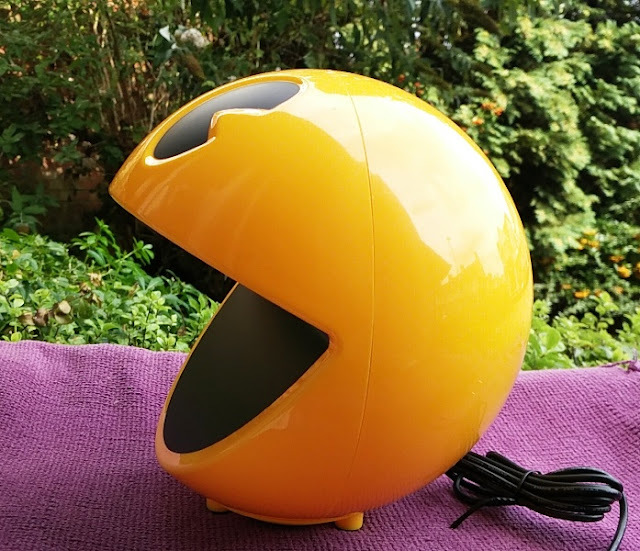 You won't have to worry about glass splatters if it breaks nor children getting burnt because the Pac-Man lamp does not get hot to the touch even after running for a few hours.